If your client has undergone a major change in their life and is finding it difficult to adjust and accept that their life now takes on different routines then they could be experiencing internal anxieties which can in turn lead to depression, withdrawal and other symptoms. Different stages of our life often seem to flow from one transition to another and we can deal with this. 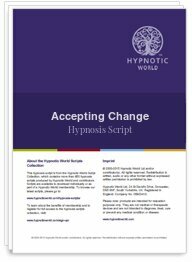 However, certain things happen that are out of our control and when there is little time to adjust, this Accepting Change hypnosis script can help to re-frame your client's thought patterns to help them to welcome and even enjoy the new experiences that will be coming their way.